If you use iCloud Keychain to store your logins, account passwords, credit card info, application passwords, and web form passwords you may want to change the iCloud Keychain security code on a regular basis as part of a safe security plan to protect all of your online information. Using the same process you can also update the telephone number associated with your iCloud Keychain account should you ever change phone services or devices. Managing these basic security measures for the iCloud Keychain service is pretty straightforward, but the location of these options seems to be a case of hiding features in plain sight. You don't need to disable the keychain or start from scratch just to perform these housekeeping updates. The secret, if you can call it a secret, is to use the iCloud preference pane to manage all of your iCloud account settings including those involving keychain access. This is by far the easiest bit of keychain data to change. There are a number of reasons for a phone number to change, but regardless of the reason, your iCloud Keychain must have an up-to-date number to use when you want to grant a Mac or iOS device access to your keychain data. As you work through the instructions below, notice that Apple changed where the Keychain phone number is accessed between OS X Mavericks and OS X Yosemite. Launch System Preferences by clicking its Dock icon, or selecting System Preferences from the Apple menu. In the System Preferences window, select the iCloud preference pane. In the list of iCloud services, you should see a checkmark next to the Keychain item. Do not uncheck the Keychain item; you're just making sure that the Mac you're currently using is indeed making use of the iCloud Keychain service. If not, you'll need to move to one of your Macs that is already configured to use the service. In the left-hand sidebar of the iCloud preference pane, click the Account Details button. In the Verification number field, enter your new SMS-enabled phone number, and click OK.
Click the Options button associated with the Keychain service item. Use the Verification number field to change the security phone number. Remember the phone number must be associated with a phone that is SMS enabled. Click the OK button. The updated phone number will now be used to verify your identity when you want to allow a new Mac or iOS device to access your keychain data. There are two reasons you may want to change the iCloud Keychain security code, as a routine update to ensure maximum security of your online data or because you fear someone has used the keychain security code to gain access to your information. There are two methods for changing your security code. The first assumes that you're using a Mac that is already set up to use iCloud Keychain. This is the preferred method for changing the security code. It allows you to make changes to the security code without losing any of the information stored in the iCloud Keychain. The second method allows you to reset the iCloud Keychain password from any Mac that you're set up with an iCloud account, but haven't enabled for the iCloud Keychain service. This method allows you to create a new security code, but it also forces the iCloud Keychain data to be reset, thus losing all of your stored keychain data. This method isn't recommended unless you feel you must reset your keychain immediately, perhaps due to a lost or stolen Mac, or the discovery that someone has gained access to your keychain data. Select System Preferences from the Apple menu, or click the System Preferences icon in the Dock. The iCloud window will open and display a list of available iCloud services. You should see a checkmark next to the Keychain item. Do not uncheck the Keychain item; you're just making sure that the Mac you're currently using is indeed making use of the iCloud Keychain service. After you verify that the Mac you're currently using is associated with your iCloud Keychain, you can change the security code. From the iCloud preference pane, click the Account Details button. Click the Change Security Code button. You can create a new security code by following the onscreen instructions. 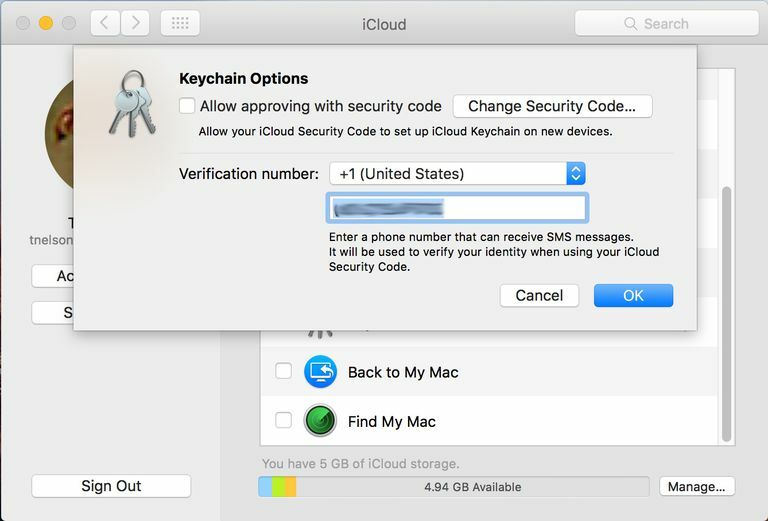 For a step-by-step guide to creating a stronger security code, see Set Up iCloud Keychain on Your Mac, pages 3 through 6. Once you finish changing the security code, click the OK button to close the iCloud Account Details sheet. A drop-down sheet will appear, asking for your Apple ID password. Enter your password and click OK.
iCloud will update the information. You can quit System Preferences once the iCloud preference pane returns. In the iCloud preference pane, find the Keychain item. Click the Options button associated with the Keychain item. In the sheet that drops down, click the Change Security Code button. Follow the onscreen instructions to change the security code. You can find additional details in the guide Set Up iCloud Keychain on Your Mac. This method will cause all keychain data stored in the cloud to be replaced by the keychain data stored on the Mac you're using. Any Mac or iOS device that's currently set up to use your iCloud Keychain will have to be set up again. In the list of iCloud services, the Keychain item should not already have a check mark. If it does have a check mark, use the instructions for changing the security code using method 1, above. Place a checkmark in the box next to the Keychain item. In the drop-down sheet that appears, enter your Apple ID password, and then click OK.
A new drop-down sheet will ask if you wish to use the security code or request approval to set up your iCloud Keychain on this Mac. Click the Use Code button. You will be asked to enter the iCloud Security Code. Instead of entering a code, click the Forgot Code text, just below the Security Code field. You'll see one final warning: "Are you sure you want to reset iCloud Keychain? All passwords stored in iCloud will be replaced by ones on this Mac, and you will be asked to create a new iCloud Security Code. This action cannot be undone." Click the Reset iCloud Keychain button to delete all passwords stored in iCloud. You can create a new security code following the onscreen instructions. For a step-by-step guide to creating a stronger security code, see Set Up iCloud Keychain on Your Mac, pages 3 through 6. You can quit System Preferences. That's the basics of managing an iCloud Keychain account.